What can we say about our office? You’re going to love it here. The Silberman Dental Group is a dentist office in Waldorf where we mix synergy with modern technologies. Dr. Silberman and our dedicated team work very hard to create a comfortable and enjoyable experience for you. Conveniently located near you, we offer the BEST family dental care in Charles County and surrounding areas. We are very current with the latest and greatest dental technologies. This allows our team to show you what’s going on with your smile and make it that much easier to achieve overall wellness. Gone are the days of multiple appointments and wearing temporaries to get a crown. With CEREC, we can craft a beautiful, custom restoration right in just one appointment. It’s easier than ever to take x-rays of your teeth with less radiation exposure. The Silberman Dental Group uses the most modern digital x-rays. Dr. Silberman uses innovative technology like the intraoral camera to detect small dental problems before they become extensive issues. This tiny camera is a fantastic diagnostic tool for viewing different angles in your mouth while picking up on details that may be overlooked without it. Dentistry is all about trust, and the intraoral camera allows you to see precisely what Dr. Silberman is seeing and why you would need the proposed work. Want to see it in person? Come stop by for a visit with your Maryland dentist and our team will be more than happy to give you a personal tour of the waiting area, treatment areas, and answer any questions you might have about our dental services. OUR DENTIST OFFICE MAKES DENTISTRY FUN! 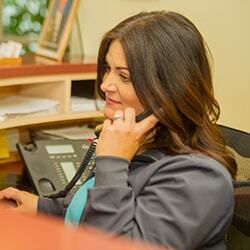 Professionalism and laughter are commonly heard throughout the office – it’s quite contagious. If you’re experiencing dental phobia, we’ll talk you through the process to ensure you’re comfortable and even offer nitrous oxide. You’re in control of the entire process, and if you ever need a break, just raise your hand and we’ll stop. Also, you can feel relaxed by snuggling up with a warm blanket and watching your favorite movie during your procedure. The moment you walk into our office our front staff will greet you with warm smiles and will gladly answer any questions you may have. Our hygienists and assistants will continue the warm embrace by making sure they are gentle and educational about your overall health. You’ll always get to see Dr. Silberman at every appointment and can expect him to be friendly, courteous, and gentle with you. Fill out the form below or give us a call and set up your complimentary consultation to experience the Silberman difference for yourself.